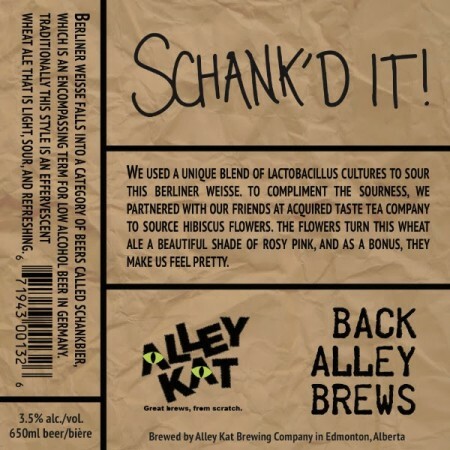 Alley Kat Back Alley Brews Series Continues with Schank’d It! This beer was soured with a unique blend of lactobacillus cultures, and then turned a beautiful shade of rosy pink using hibiscus flowers from Acquired Taste Tea Company. It falls into a category of beers called Schankbier, which is an encompassing term for low alcohol beer in Germany. This wheat ale is light, sour, and refreshing, with tart hibiscus flavours and a wheat finish. Schank’d It! will be available soon in 650 ml bottles at Alley Kat and select retail stores in Alberta.